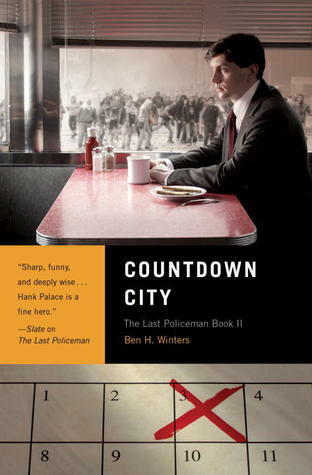 In Countdown City, book two in The Last Policeman trilogy, we return to Detective Hank Palace’s pre-apocalyptic world. The asteroid collision predicted to destroy most of earth is now only 74 days away. Hank has been laid off from his job in the Adult Crimes Division of the police department. There are still plenty of officers patrolling the streets on alert for the ever-increasing acts of violence, but no one cares about solving crimes anymore. No one except Hank. Martha’s husband has gone missing. Hank wants to help his old friend but he no longer works for the police department. There’s no way to conduct a proper investigation even if he did. Society has almost completely broken down. There’s no way to put out an APB or access a database. Martha is desperate so Hank offers to ask around and see what he can find out. Soon Hank is digging into the case and putting the pieces together. The underlying theme in the second book is the same – what happens to society when there are no longer any rules. But now, with only 75 days until the asteroid strikes, there is more urgency than in the first book. The pace has picked up. Hank is pushing himself because he knows time is limited. While many people have abandoned their responsibilities and gone Bucket List, Hank is one of the few who remains stable while the world around him crumbles. The book is a fun mix of genres: A pre-apocalyptic detective thriller; a blend of speculative fiction and police procedural. I wouldn’t classify it as science fiction although the asteroid strike may have some people thinking in that direction. There is a well-drawn cast of characters, fast pacing, a mystery to solve and an intriguing premise. Unlike most dystopian novels where we are thrust into the story after the disaster occurred, in the pre-apocalyptic world we experience the events that contribute to the crumbling of society and the destruction of civilization. One of the big questions for the reader to consider is what would you do in this situation? Keep your promises to friends, family and society? Continue living life as usual? Plan to survive? Give up? Or run off and seek your passion, ie go Bucket List? While the mystery was good, it wasn’t the strongest part of the story. I was just a little disappointed in the resolution, a slight twist that I found a little improbable. The real story, and the reason to keep reading, is the crumbling world around Hank and how people respond to the upcoming disaster. Scam artists, survivalists, entrepreneurs – lots of interesting characters. Preparations are being made by some to hunker down when the asteroid strikes. These people intend to survive and start over. This is the second book in The Last Policeman trilogy. While this does continue at the point in time where the first book left off, it is a self-contained mystery/detective story that can be enjoyed on its own. To get a good understanding of the pre-apocalyptic aspects, I recommend beginning with the first book to get a flavor for the progression of the end-of-the world scenario. I am anxiously awaiting the final installment. **Any advertisements appearing below are placed by WordPress, not me. I have no control over their placement nor do I endorse or derive any income from them. Hm, I thought the urgency was lacking in the first book. It sounds like this one might be better. I thought so too. The first book was slow and steady. This one picks up the pace. The premise and characters in this sound interesting and compelling. Excellent review, Leslie! Sounds good. I hope you love the third book even more! I added the first one to my wish list last September. Why is there so little time to read? !